“Maximum Return to Nitrogen” (MRTN) rates are available from the Corn Nitrogen Rate Calculator (http://cnrc.agron.iastate.edu), a website maintained by universities in Corn Belt states. MRTNs give the nitrogen rate that, over time, will produce the highest economic return for nitrogen use. Many nitrogen rate trials provide the basis for determining MRTNs (see the “About” section of Calculator for more detail). Prices used in the calculations of MRTN rates in Table 1 are $3.70 per bushel for corn, $610 per ton for anhydrous ammonia, and $280 per ton for 28% nitrogen solution. 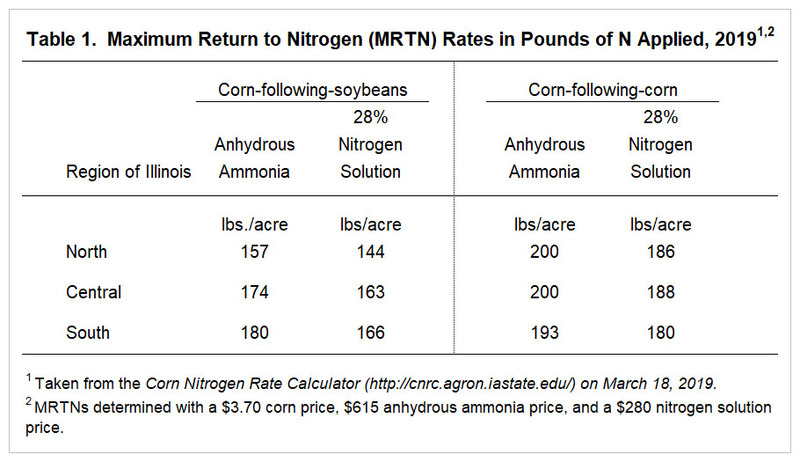 Lower MRTNs result for 28% because nitrogen costs more in 28% than in anhydrous ammonia. 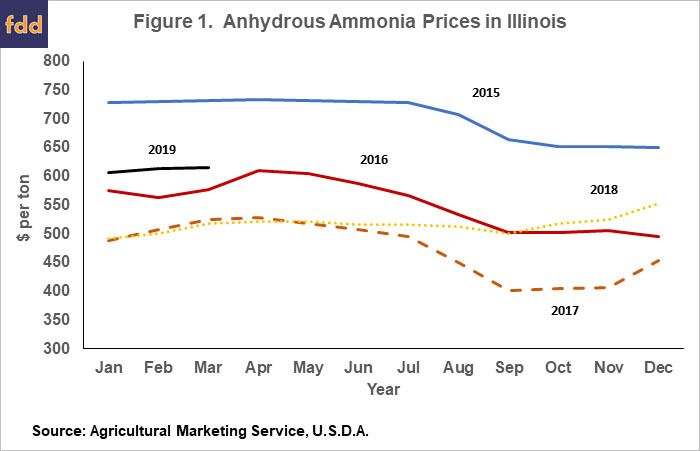 The costs per pound of nitrogen in anhydrous ammonia is $.37 per pound ($610 price / (2000 pounds x .82 analysis)) compared to .50 per pound cost for 28% ($.50 = $280 / (2000 pounds x .28)). Schnitkey, G. “Grain Farm Income Outlook for 2019: Negative Incomes Ahead?.” farmdoc daily (9):7, Department of Agricultural and Consumer Economics, University of Illinois at Urbana-Champaign, January 15, 2019.